Trying to describe Dylan Ward’s newest work is kind of like telling someone what happened in your dream last night. The Lesser Evils has a lot going on, and when you say it out loud none of it seems to makes sense. Amy Johnson plays a boss/circus ringleader/trickster god character followed by a squad of four “yes men” who are anointed with shaving cream. Chloe Albin teaches Shane Donohue to tap dance. A pile of paper towels turns into a newborn baby. Then everyone does modern dance to Enya. The work is born out of a recently completed residency at Base, and the showing at the same location has a work-in-progress vibe. There is a quality of storytelling here, but it seems like pieces of the story are missing and other pieces feel redundant. Out of the epic journey of images in this work, two sections illustrate its fantastic potential. 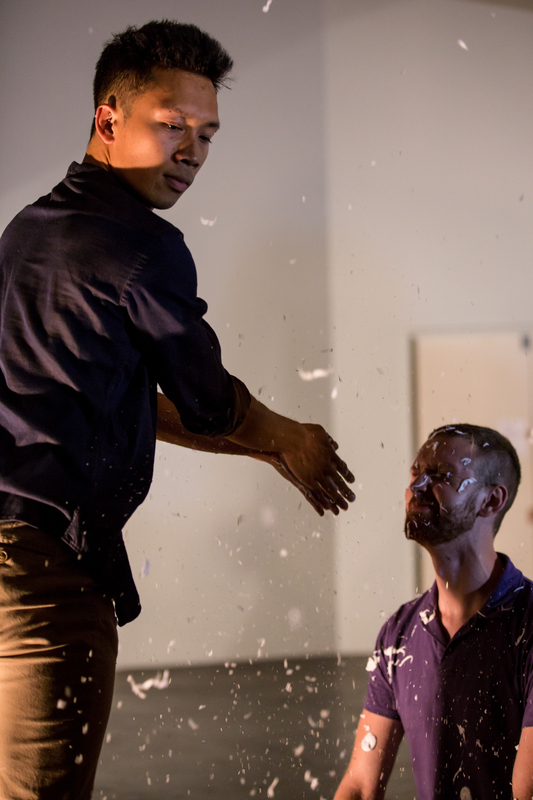 The first is a nuanced duet between Donohue and Alex Pham, who subtly explore relationship dynamics. There is a togetherness here that is not quite in agreement. Stops and starts belie an underlying discomfort. They pull each other across the room via awkward hand holds—grasping an elbow or the back of the head. It isn’t violent but it’s loaded. There are moments of tenderness: a gentle hand-pat, an offering, but then Donohue points expectantly at something invisible to us and we feel the tension just below the surface. The second stand-out section is between Donohue and Albin, where the two kindle a playful friendship that feels fresh and like maybe the only thing grounding these characters in sanity. They play with shaving cream; they encourage each other; they dance in huge sweeping phrases with their long bodies. Their togetherness feels together, and there’s relief that they found each other, but who are these characters in the grand scheme of the piece? From some brief dialogue about the millennial workweek, plus the business-casual costumes and prolific use of shaving cream, the piece would appear to be about existing within the expectations of modern society. Donohue, Albin, and Pham seem to be the protagonists until their storylines are consumed by the chaos of everything happening on stage. Kim Lusk and Laura Aschoff also showed work during the evening. Lusk’s Underdog Solos features the same cast as last year’s Trio in Silver and a similar choreographic style as well: balletic virtuosity mixed with quirky dance moves to driving pop beats. 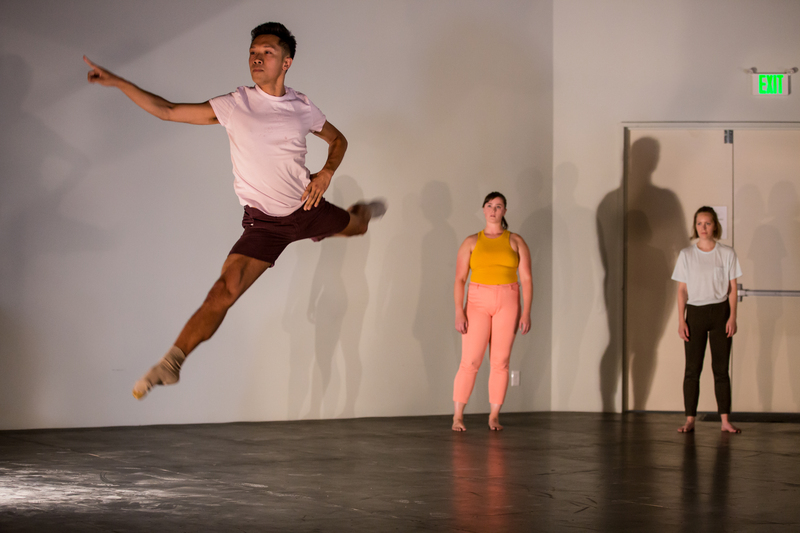 What distinguishes her work is its incredibly dry presentation; whether the dancers are in full split leap or lingering awkwardly in a non-impressive fidget, their blank faces never give anything away. It’s funny, but Solos is notably not as funny as Trio, and doesn’t strive to be. 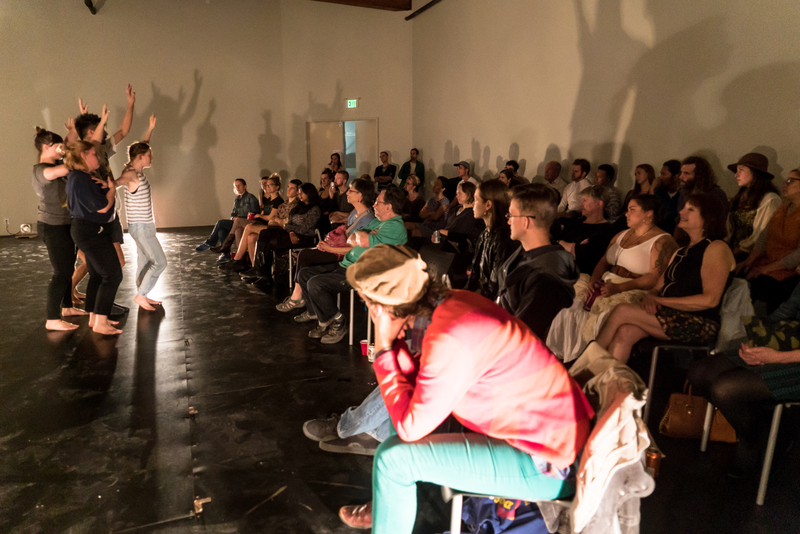 The three dancers, Alex Pham, Erin McCarthy, and Lusk, alternate performing solos while the others stand and watch. Except that one of the dancers isn’t getting a turn. McCarthy doesn’t dance for a full 15 minutes. Finally, she gets her chance, standing in preparation position center stage, waiting for music that seems to start reluctantly. McCarthy’s solo is slower and draws us into the details. Perfectly articulating her foot, she carefully places herself on balance and slowly lifts into an arabesque. We see the slightest wobble grow larger as she fights to maintain her balance, and finally she ends the moment with an accented jab through her limbs into a rigid position as if to say, Fine. I did it. Moving on. McCarthy’s part gives way to more solo cycles by Pham and Lusk, which end without conclusion. If it weren’t for the choices made around McCarthy’s role, this work would seem to be a simple study in Lusk’s aesthetic style. Do Lusk and Pham’s roles exist merely to frame McCarthy and her subtle outsider-ness? To seduce us with entertaining leaps and comedic hip thrusts and then trip us up with humanness and vulnerability? Yes Even That, Aschoff’s work, presents a different take on vulnerability. 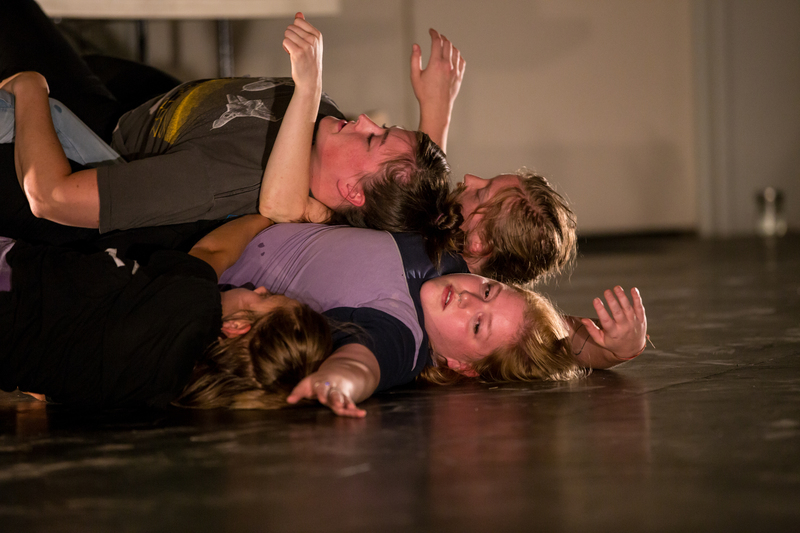 It’s gritty, personal, and blunt, seeming to come from the present nature of these dancers’ lives and the reverberations of past experiences that define them. Framed by off-hand comments on depression, the work manifests like a collection of tasks and images, but each feeds into a greater narrative. At one point, the group of five steps side to side in a clump, responding in unison to internally given instructions: put your hand in the air, turn around, smile, say someone’s name. It all seems an exercise in keeping up appearances, continuing on with the demands of life despite a pervasive internal state of not-OK.
Nathan Blackwell’s physicality has a darkly lilting quality that permeates the piece—the tension of always being just a little bit off balance covered by a contemplative cool. At one point, a recording of echoing voices calls his name over and over. It’s like we’re witnessing a memory that haunts him. “There’s some cake over here,” the voice says, and somehow there is a chocolate cake on stage that I hadn’t noticed before. He removes his pants and sits bare-assed in the cake. An expression of indulgent ecstasy creeps over his face until the calling voice begins again and instantly Blackwell stiffens, tense and guarded once more. McCarthy dances in this piece as well, showcasing her range of performance ability. In Yes Even That she scream-sings about her sexual frustration into a curtain wrapped around her head and chest. Later she has an extended solo: a giddy confession of her darkest personal truths that then builds into heart-wrenching repetitive self-deprecation. Again, McCarthy’s vulnerability is the pinnacle of the work, but this time it isn’t gentle and waiting to be noticed—it demands engagement. Because each dancer introduces themselves by their name and identity, there is no doubt that this is her real, lived experience, and she leaves it stripped bare for all to see. Having witnessed and appreciated her commanding performance in Underdog Solos, we are given the gift of seeing how one can perceive themselves so differently than the way they are perceived. For the majority of us who battle with feeling “not good enough,” we empathize with this brave performer. Underdog Solos, Lesser Evils, and Yes Even That performed at Base on September 2 and 3, 2016. For more information visit sleepnod.org and www.facebook.com/thisisbase.